San Carlos Auto Electrical Repair - A+ Japanese Auto Repair, Inc. Car electrical repair is becoming more and more important in today’s computer controlled vehicles. A+ Japanese Auto Repair leads the way in the diagnosis of electrical circuits and computer controlled systems. Many local auto repair shops from San Carlos, Belmont, Redwood Shores, Redwood City, & Menlo Park bring vehicles to A+ Japanese Auto Repair for electrical repair that they cannot diagnose. Our expertise, technicians, and extensive training in electrical diagnosis and repair has allowed A+ Japanese Auto Repair to be the San Carlos leading auto repair shop. How do I properly jump start my car battery? What does the battery light mean on my dash? How long should my car battery light last? When do I need to change my hybrid battery? 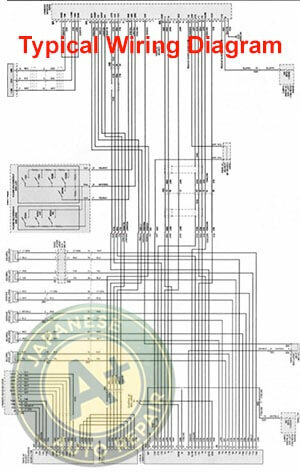 The complexity of these electrical systems can be visualized in wiring diagrams. Electrical car diagrams will show the wiring, lighting, switches, and solenoids up to the vehicle module but often don't show the technician what is going on inside the module or brain of the operation. This is where specific vehicle knowledge and access to the proper automotive electrical schematics are very important. 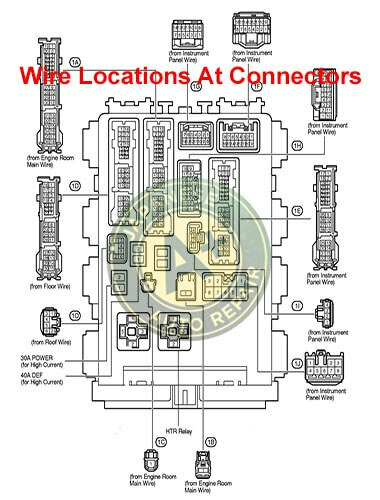 Below is a wiring diagram from a 2000 Toyota Land Cruiser (Fig A.) Each line indicates a wire. In (Fig B.) Imagine then taking each straight line (wire in figure a.) and accessing testing each one individual to identify an issue and repair it. Typically we test it between the component to check for shorts and at the connectors to make sure signals are getting where they need to go. You can imagine the miles of wire wrapping around your vehicle to all different locations. It takes a skilled mechanic to diagnose electrical failures. Our many years and expertise in electrical diagnosis means a cost savings to our clients as we have either seen your electrical concern before or will be able to find and repair it quickly and correctly. An electrical circuit can be found in every part of a modern car. Today manufacturers are using Electrical Computer Area Network Systems or CAN systems to control vehicles. To visualize the complexity of these CAN Networks think of separate computers or modules for your heated seats, power windows, radio, GPS, transmission, computer controlled engine components, etc… all connected and talking to each other. A modern car even has electrical blue tooth circuits in the tires monitoring tire pressures at millisecond intervals. Needless to say, automotive electrical repair is complex and A+ Japanese Auto Repair in San Carlos can handle it! What does the tire pressure light mean on the dash? A+ Japanese Auto Repair requires our ASE certified auto mechanics to stay trained with the latest electrical diagnostic methods, procedures, and repairs by constantly training and attending electrical related classes. Our ASE certified electrical technicians are experts at electrical diagnosis on CAN (computer area network), OBDII (On Board Diagnostic 2), OBDI (On Board Diagnostic 1), Hybrid Drive Systems (HDS) and all 12 volt electrical systems. These electrical systems are used by the following manufacturers: Honda, Acura, Toyota, Lexus,Nissan, Infiniti, Mazda, Subaru, Mitsubishi, Scion, Isuzu, Kia, Hyundai, and Hybrid Vehicles. Whether your automotive system is a CAN, OBDII, or OBDI, the majority of these automotive electrical systems are what is referred to as a 12 volt electrical system. A healthy, fully charged vehicle battery is 12.6 volts. A health, properly working vehicle charging system will display between 13.5 and 14.5 volts. What does it mean when my battery light is on? When it comes to hybrid vehicles, we are also hybrid electrical experts. Some of the hybrid drive systems are now running up at the high voltage 400V+ and high amperage which have the ability to be dangerous and or lethal. Never try to diagnose these auto hybrid electrical systems by yourself as they are very dangerous. How long does a hybrid battery last? Always have an expert like A+ Japanese Auto Repair Inc. perform qualified electrical system diagnosis with Master certified ASE auto repair technicians who are experts on your Honda, Acura, Toyota, Lexus, Nissan, Infiniti, Mazda, Subaru, Mitsubishi, Kia, Scion, Hyundai, Isuzu, and Hybrid vehicles. A+ Japanese Auto Repair Inc. uses the latest equipment and diagnosis procedures when it comes to electrical diagnosis, check engine light diagnosis, and electrical repair. By using the proper equipment and proper training, we are able to be efficient and provide a cost savings for our clients. Our electrical repairs are covered by our 24,000 mile / 24 month warranty on all auto repair. 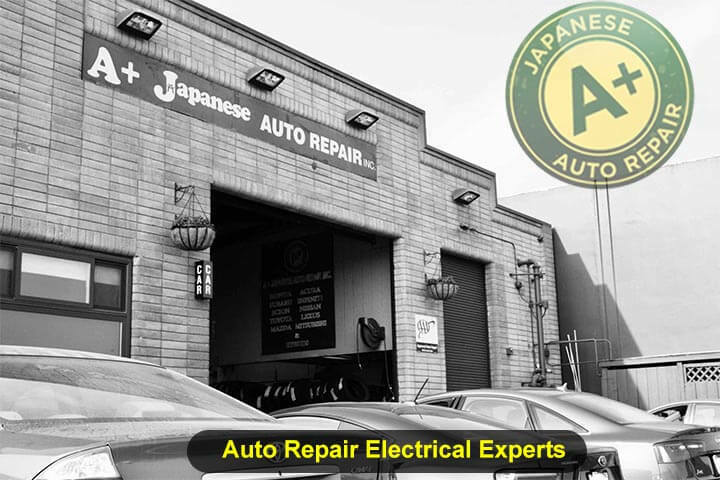 A+ Japanese Auto Repair are experts at electrical system diagnosis and repair on: Honda, Acura, Toyota, Lexus, Nissan, Infiniti, Mazda, Subaru, Mitsubishi, Kia, Scion, Hyundai, Isuzu, and Hybrid vehicles. 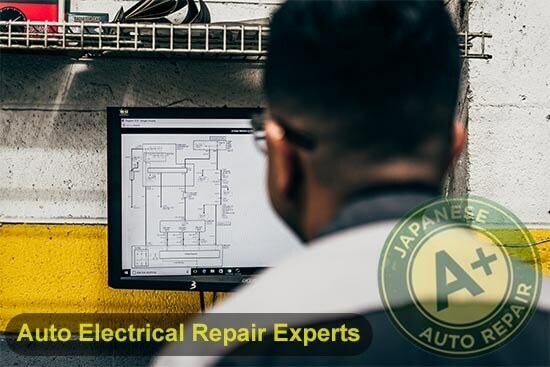 If you have any further questions regarding electrical diagnosis and repair please contact A Plus Japanese Auto Repair or make an appointment today. We look forward to meeting you.